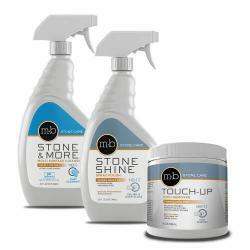 Top-of-the-line granite countertop care & marble cleaning spray extremely popular with consumers and pros! For routine use cleaning marble, cleaning granite countertops, quartz countertops, Corian, travertine, and all other natural stone countertops and backsplashes. Sprayer included. Also an excellent porcelain and ceramic tile cleaner. Very effective, quick-drying, streak-free formula with optical brighteners for superior shine and color on all your natural stone, quartz, Corian, granite and marble countertops. Great for mirrors and windows too! Many think it's better than Windex, but won't harm acid-sensitive stones like Windex does. NOTE: For cleaning showers and bathtub surrounds, please see the Hard Water / Soap Scum Remover, which is specially formulated to safely and effectively handle the demands of cleaning the bath & shower. 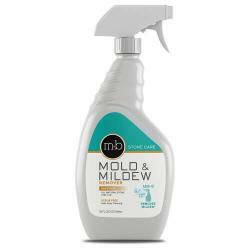 This product will remove tenacious soap scum and hard water deposits that accumulate on shower walls and tile. 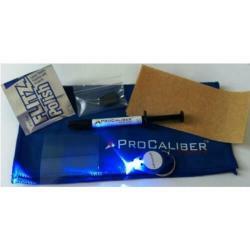 This product performs as stated. Leaves my quartz and marble countertops sparkling clean with etching the polished surface. Extremely satisfied. products. Yours does it easily in one swipe, usually. Thank you! My marble installer told me to beware of other cleaners because they have a residue that leaves streaks, so I was extremely careful when I chose my cleaner. This stuff is incredible! This was the first time ordering received product very quickly and the stone care is helping to keep my new countertops Looking great will definitely reorder. Thank you. We install a good deal of natural stone for our clients. Care and maintenance questions are common. We are obviously very conscientious in providing advice regarding products. Some time ago we ordered the Granite and Marble Cleaning Spray to "try" prior to recommending. We love this product. After using it for some time in our personal home, we responded to several clients requests for recommendations. We even gave our own bottle to one client to try on her marble surfaces. 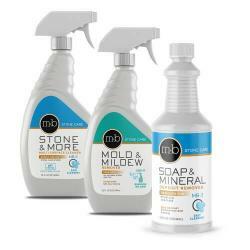 Yesterday she contacted us and asked if she could get more as she, and her cleaning service, LOVE this product! We have decided to provide this product to all of our natural stone customers. My counters look beautiful and I feel confident using this product! You're website is probably the most knowledgable about stone care so I feel confident when using your products, they work because your company knows what's best for stone. Great Product. We use it everywhere. 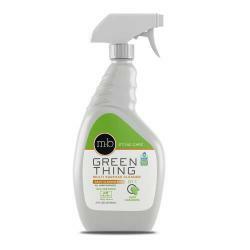 Love this product, makes all my cleaning easy. We had tried everything to keep up the look of our black Silestone countertops. Everything we tried left streaks and a dull look. We switched to StoneCare cleaner and what a difference ! Cleaning is just a breeze and we are back to loving our countertops !! I thought I had totally ruined my brand new bathroom vanity (a marble topped dresser converted to vanity). I let liquid soap set for about an hour that left a spot. Then I tried to clean it with a bathroom grout cleaner - worse but over a larger area. Then I tried to clean that with scrubbing bubbles over the entire top. Oh NO!!!! No one at orange HD or blue L knew anything about marble etching - no help there! Then I found this website. After reading so many positive reviews I thought $50 is not a bad try. I ordered the marble care kit. It came very quickly like a week or less. I tried this Marble Polishing Powder (Etch Remover) on the worse area and, after some time and elbow grease, it actually came out. So, I used it over the entire top. I followed the polish with the Granite & Marble Spray Cleaner and the Topical Stone Polish. It really does look better than it did new. No, it really does! The black seems blacker, deeper, richer color. The whites seem whiter, and the shine is phenomenal. It took about 3-4 applications on the worst spots but only one application on the scrubbing bubbles areas. The whole 6-ft top took a little over 2 hours. Now, I only clean with the spray cleaner and use the spray polish about once a month or less. This product works great. I have a new counters and it worked just like it said it would. I have been using STONE CARE Granite & Marble Cleaning Spray and it is wonderful! My countertops look so polished after using it and the smell is great too! 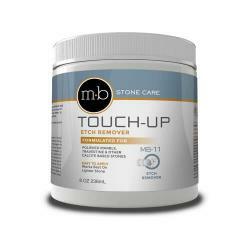 I use the Stone care cleaner on a marble bathroom counter and it cleans away spots and a nice shine. I have used Stone Care occasionally on the chrome fixtures and it cleans and shines well. We just finished our new marble bath, and wanted the best products to keep it looking like new. I am very satisfied with the stone cleaning spray, it is great for everyday cleaning and leaves the marble clean and beautiful without streaks or spots. This is very important with honed marble. We have a new marble bathroom and I was looking for a safe cleaner to use. 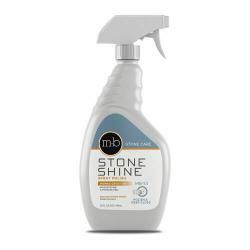 The Stone Care Granite and Marble cleaning spray works great! I also like the toilet bowl cleaner. Thank you! We have a very porous marble in the kitchen and this cleaner smells good and works well. Make sure you completely wipe off any residue because it sometimes leaves streaks. ===ADMIN COMMENT: This is a good point... this product dries very quickly as you are in the process of wiping/cleaning and will not leave streaks in this manner, however, it may leave streaks if you leave the surface too wet. Just installed Ivory Travertine tile(honed and filled, from home depot) in my new bathroom. The STONE CARE Granite & Marble Cleaner works great, tile feels clean and smooth. Sealed tile with the Impregnating penetrating sealer, went on fast and easy. I want you to know that I really like the StoneCare cleaner! It smells fresh and leaves an awesome shine with no streaks! I will be attacking my marble shower this weekend using the stone cleaner, soap scum remover, and the polishing compound before sealing with the Senguard.